Considering going vegan? You’re not alone: Every month, people test out the meat- and dairy-free diet for ethical and environmental reasons—and for their health. 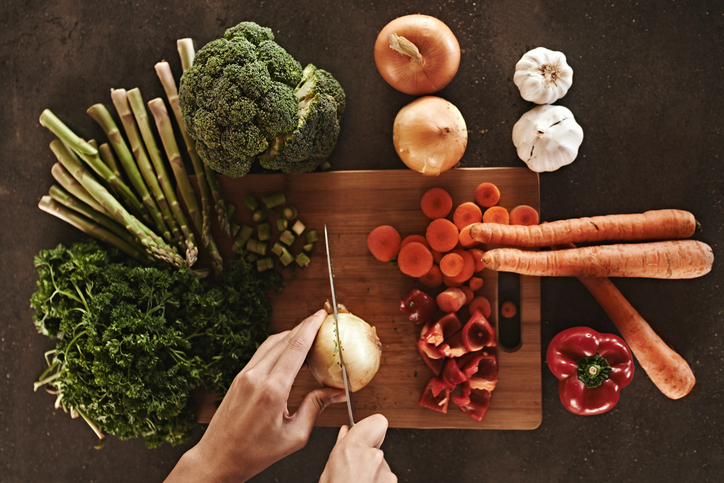 “I think there are compelling benefits to whole food, plant-based diets, which is why I do recommend this type of diet for many patients,” says Shilpa Ravella, MD, gastroenterologist and assistant professor of medicine at Columbia University Medical Center. Among those health benefits: a reduced risk of chronic diseases and possible weight loss. But before you put down your grilled cheese and say goodbye to all of your favorite chicken recipes, be warned: It won’t necessarily be easy. "Vegan diets are restrictive and can be difficult to follow for people who grew up eating animal products regularly," points out board-certified endocrinologist Shira Eytan, MD. So is it worth it? To answer that, you’ll need to know what it’s like to go vegan—especially during those potentially challenging first 30 transitional days. We spoke to nutritionists, doctors, and vegans themselves (some who’ve lived on the diet for decades and some total newbies) to find out exactly what you may experience during a month (or longer!) without meat or dairy. “Many clients tell me they are surprised by how easy it was to lose weight once they transitioned to a fully plant-based diet,” says Jennifer Mimkha, MPH, RD. That may be at least partially because many plant sources of protein are lower in calories than meat, points out Natalie Rizzo, MS, RD. Another reason? It’s not always easy to eat as a vegan, and while that might be frustrating when you want to grab a bite on the go, it has the side effect of eliminating mindless snacking. For instance, Virginia Messina, MPH, RD, who has been a vegan for over 25 years, points out that when she goes to a grocery store, she usually can’t partake of tempting, unhealthy samples, because they nearly always contain meat or dairy. Bottom line: Any weight effects you experience when you go vegan will depend on how you eat. If you opt for vegan junk food—or totally overdo it on carbs in place of meat and dairy—you could wind up gaining weight. Make balanced, healthy choices, and you could see weight loss, particularly if your pre-vegan diet was full of saturated fats and processed foods. Anecdotally, vegans report a noticeable difference in their taste buds. “My whole sense of taste is heightened, and food brings me so much pleasure. And, my hard-to-tame sweet tooth has pretty much disappeared,” says Alexandria Abramian, a California-based content director who switched to a vegan diet just a few weeks ago. Science confirms this taste-bud transformation. It’ll get better, Dr. Ravella says, but in the early days of a vegan diet, expect symptoms like gas and bloating as your body adapts to all that fiber you’re consuming. Eventually, Slater’s pizza-eating family came around, she says, and started trying more vegan food together. But is that due to a vegan diet—or something else? "We don't have real science to show that people actually have more energy when they go vegan," Messina says. The increased energy (and lack of afternoon sleepies) may be the result of a healthier diet overall, especially if going vegan means you’re avoiding sugary treats and processed foods, since those set you on a path of blood sugar spikes and crashes, Rizzo points out. As good as a vegan diet can be for your health, there is a potential for vitamin deficiencies, especially in B12, Dr. Eytan says. “Omega-3 fatty acids may also be deficient in a vegan diet, though [they] can be found in flax seeds and walnuts.” Talk to your doctor or a nutritionist who can help determine whether or not you should consider taking supplements to replace these missing nutrients, along with iron, zinc, and calcium, she says. The bacteria inside your gut can have a big impact on your health. A standard American diet fosters the growth of some disease-promoting bacteria, says Dr. Ravella, while a more fiber-rich diet leads to a diverse microbiome full of friendly bacteria. Switching to a fiber-rich vegan diet results in rapid changes to your gut bacteria. “After only a couple of days, if you switch someone from a meat-based to a plant-based diet, or vice-versa, you get profound changes in the microbiome,” she says. If a full-time vegan lifestyle—or even a 30-day challenge—isn’t for you, you’re not alone. “I have one vegan week a month now to vary my diet but remain a flexitarian,” Koren says. Abramian’s still enthusiastic about a vegan diet—with one daily exception. This article originally appeared in Health.com.